90% of the super rad DIY wedding ideas you found on some indie wedding blog originally came from Martha Stewart. You know that, right? I mean, who do you think brought the goddamn mason jar out of the realm of moonshine and into the realm of the "signature cocktail"? In other words: DON'T EVER QUOTE MISS MANNERS AT ME AGAIN. THX. and speaking of mason jars, have you seen the GIANT Ball jars at Target?? They're HUGE. Borderline ridiculous. Possibly amazing? I always knew you loved her. I just kind of thought it was a deep dark secret. Way to admit it, lady. We're all there with you. I love all the people that publicly hate on her, but secretly use all her stuff. She might be a little weird but she's a genius. damn girl ! you take charge and GO AHEAD ! if you ever need another martha illo, may i propose a still from fine young cannibals' "good thing" video? too oblique? I'll quote Miss manners if I want to. I love her too. She scares me a bit, but gotta respect. I'm with Amanda. Martha may have some great ideas for things to do with tissue paper and dried pasta but Miss Manners is a guru. Word up. I love Martha. And btw your advice for yesterday's complainer was right on. i don't even comment, and i'm jumping on this. yes martha and the marthalifephilosophy is batshit. but does that make it any more delicious? I have to admit, I kinda ignored her until the arrest. And now, after surviving jail and still maintaining a media empire and insane crafting/design/event gorgeousness? Yeah, I'm sold. Badass women get my respect even if I couldn't/wouldn't copy their style. Hey now! I love the Martha, too! Did I say anything mean about her at all? She's queen of everything crafy and beautiful! You can pry my four precious Martha Stewart Weddings mags from my cold dead hands, lady. Just, you know, Martha's not really an etiquette authority. I learned of Miss Manners' awesomeness on A Practical Wedding and haven't looked back since. So I'm with Amanda and Peonies (obviously). Also, I wasn't quoting Miss Manners at you. I was paraphrasing Miss Manners at the girl who asked the question. Plus, I didn't disagree with your advice. So, um. I adore this blog and I think your advice is spot-on, but jeez... touchy much? love martha. 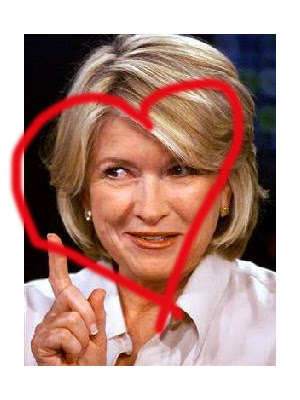 love that you love martha. love reading your hilarious comments. love that i don't agree with some of your advice and still love reading it. fierce honesty and humor. thanks! Oh I love Martha! When my centerpieces were lacking something I thought, "What would Martha do?" Then I spray painted the branches and they turned out great! gotta love a domestic maven with a criminal record. it's a good thing. Martha is amazing. Have you seen her appearance on Conan and Conan's appearance on her show? Awesome! The woman ate a Taco Bell burrito and sipped a 40 of Olde E.
I just read New Old House. She is totally insane the way she restored a house she wasn't even going to live in. And I love her snobby quirks (like ragging on the construction guys in the picture captions and making snide comments about the previous owners' "less than avid housekeeping").